Higher global aluminium prices overcame nearly crippling sanctions in the second quarter to boost Russian Federation aluminium giant U.C. Rusal’s bottom line. Yesterday’s results were the first since the Trump administration’s April 6 sanctions on Oleg Deripaska, En+ Group, Rusal, and several other Russian individuals and firms. Rusal said the U.S. Office of Foreign Assets Control’s designation lifted prices for aluminium and alumina, but hurt the rouble relative to the dollar. However, a weaker rouble benefited Rusal in the quarter, as the lion’s share of its costs are based in the Russian currency. The firm produced 939 thousand metric tons of primary aluminium in the quarter, up from last quarter’s total of 931 thousand metric tons and also above last year’s second-quarter total of 921 thousand metric tons. Alumina production in the quarter totaled 1,924 thousand metric tons, down slightly year-on-year from last year’s second-quarter refining total of 1,928 thousand metric tons, but up quarter-on-quarter from last quarter’s tally of 1,892 thousand metric tons. Rusal mined a total of 3,320 thousand metric tons of wet bauxite in the quarter, better both year-on-year from last year’s total of 3,090 thousand metric tons in the second quarter, as well as last quarter’s total of 2,960 thousand metric tons. Sales of primary aluminium and aluminium alloys were down in the quarter, coming in at 783 thousand metric tons. 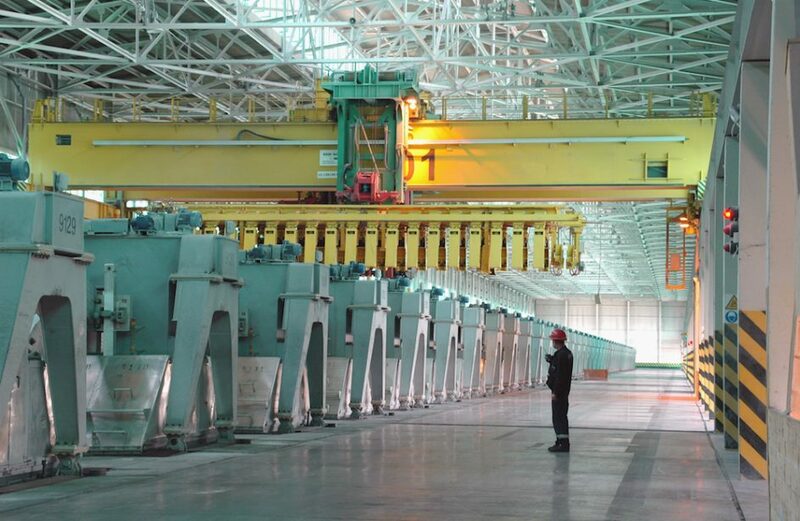 Rusal’s sales total in the second quarter of last year came to 1,002 thousand metric tons, and the firm’s total last quarter was 965 thousand metric tons. Rusal’s revenue in the quarter totaled US$2,253 million, down year-on-year from last year’s second-quarter total of US$2,467 million, and down quarter-on-quarter from the first-quarter total of US$2,744 million. Adjusted EBITDA for the second quarter came to US$552 million, up from last year’s second-quarter total of US$510 million, but down from the prior quarter’s total of US$572 million. Rusal’s adjusted net profit for the period totaled US$218 million, a rise over last year’s second-quarter total of US$202 million, but down from the previous quarter’s figure of US$317 million. Sales of primary aluminium in the quarter totaled US$1,814 million, down from the prior quarter’s total of US$2,245 million. Alumina sales came to US$210 million, down slightly from the first quarter’s total of US$237 million.